As a leading power management IC specialist, Richtek provides complete product lines for LED light fixtures including AC/DC non-isolated, AC/DC isolated, MR16, DC/DC and Linear solution. We also provide different kinds of white LED Drivers. With high efficiency, excellent current regulation, high power factor, low THD with low BOM cost, Richtek can always help designers to develop a cost-effective LED driver board for this cost sensitive market. LED Drivers will regulate for constant output current instead of constant output voltage, because LEDs need to be driven with certain current for specific light output. Most high brightness LEDs have a forward voltage between 3 ~ 3.5V. Depending on the input voltage and the number of LEDs used in the LED string, the converter can be a buck, boost or buck-boost (for example when the application needs to cater for different LED strings). When driving high numbers of LEDs like in LCD backlighting systems, multi-string LED drivers are used. 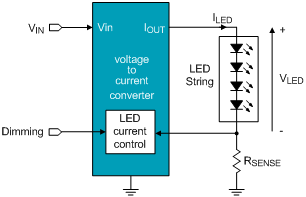 In some off- line LED drivers, linear topology is used. Most LED drivers will also include dimming functions, to be able to control the output current, thereby controlling the LED light output. Key parameters for selecting LED drivers are input voltage, LED string voltage and LED string current, single/multi-string LEDs and dimming. In LED drivers powered from the AC line, it is also important to know whether the application needs to be isolated or non-isolated, and whether the LED driver needs to fulfill power factor and THD requirements. Parametric Search: Get your design started in no time!